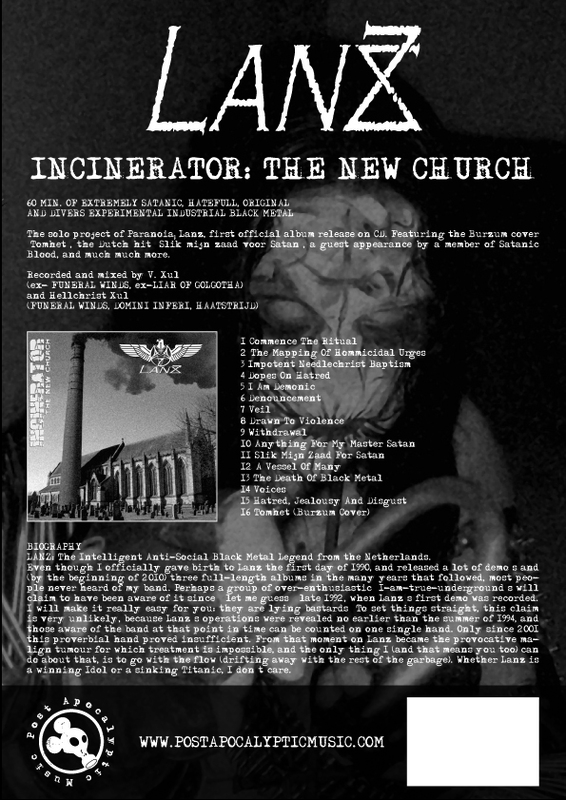 This CD contains 60 minutes of extreme Satanic, hatefull, original and experimental "industrial" black metal. The album contains a cover of Burzums 'Tomhet', the Dutch hit 'Slik mijn zaad voor Satan', a guest appearance by one of the members of Satanic Blood, a secret track and much more interesting stuff! Recorded, mixxed and mastered by V.Xul (ex- FUNERAL WINDS, ex-LIAR OF GOLGOTHA, ex-ISRATHOUM, a.o) and Hellchrist Xul (FUNERAL WINDS, DOMINI INFERI, HAATSTRIJD, a.o.). 2 full tracks can be heard on the releases page. Aks for cheap wholesale prices!